Lightweight and maneuverable it transports easily in a pickup. 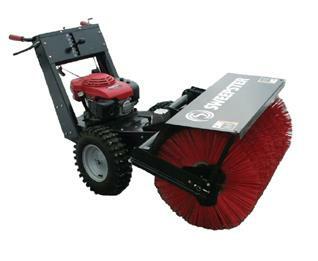 The 5.5 hp Honda engine powers the 36" wide, 24" diameter two speed brush. 5 speed transmission forward, neutral and reverse. The large tires and differential provide excellent traction and outstanding maneuverability. Truly a 4-season cleanup machine on pavement and turf cleaning thatch, gravel, snow, and more. * Please call us for any questions on our sweeper lawn powered 36 inch walk behind rentals in Mount Pleasant MI, Alma MI, and Saginaw MI.